Rosco McGlashan has been synonymous with the very peak of speed sport in Australia. 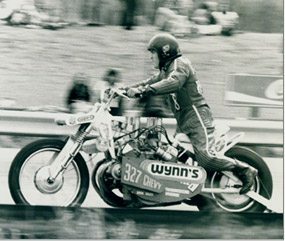 Rosco started his motorsport career riding competition motorcycles at Surfers Paradise International Raceway. 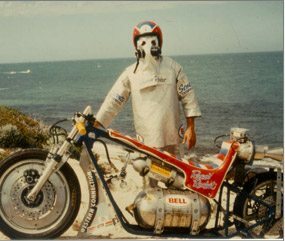 He graduated to the amazing Australian designed and built “Crazyhorse” V8 powered motorcycle. This was an incredible machine which had no clutch, so the back wheel would sit up in a cradle, then Rosco would give it a rev and just rock it off the cradle! “It spat me off a few times and when it did, it did it in a big way!” remembers Rosco. “Crazyhorse” was followed by an even higher performance rocket-powered bike which was so fast that it was not allowed to be raced on Australian tracks. Further more the very volatile hydrogen peroxide rocket-fuel was extremely hard to come by, because of its unpredictable characteristics and was soon banned by the Australian Government. To even think of such a machine, let alone ride it, further adds to this man’s infatuation with speed and his “dare to be different” approach. You can’t help but wonder what this machine would have done if allowed to have it’s head… the mind boggles! 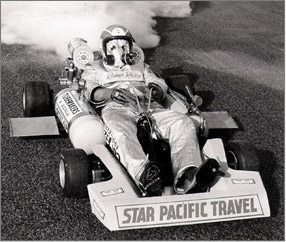 In 1980 whilst living in the USA, Rosco was instrumental in the development of a rocket-powered Go-Kart in which he reached 253 mph (407 km/h) over the 1/4 mile in 5.9 seconds! “It was an incredible feeling sitting in that thing with the fuel bubbling and gurgling just behind your head and then hitting the throttle” says Rosco with a smile. “It was truly an awesome machine” and it is still the fastest Go-Kart in the world and is now housed at the historic York Motor Museum, which is 60 km east of Perth in Western Australia. Powered by a J34 Westinghouse jet engine with purpose built after-burner. The engine was originally fitted to the Lockheed Neptune as a Jato engine, producing 6,500 lbs thrust. Powered by an Australian-manufactured Atar 09C5, Jet Turbine as used in the Mirage fighter. 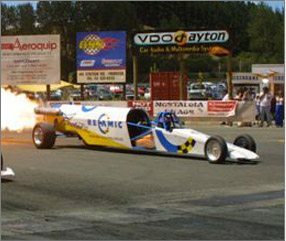 In 1993 Rosco assembled his first Land Speed Racer known as “Aussie Invader II” powered by a 36,000 hp Mirage Jet Fighter Engine. This racer was a culmination of 10 years, blood, sweat and tears. 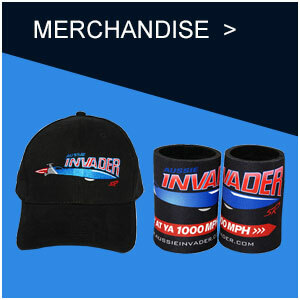 On their first outing Aussie Invader II reached a speed of 450 mph. 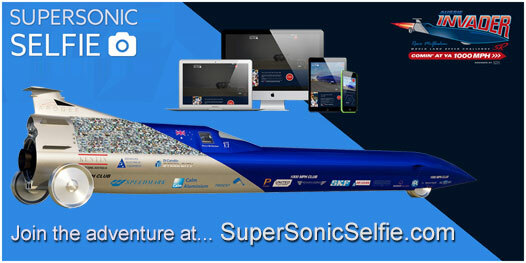 Bad weather forced the team away from their Salt Lake race venue in central Australia, back to their base in WA to regroup and prepare for their next attack on the Australian Land Speed Record of 403 mph. 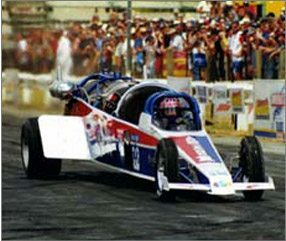 1994 saw a revamped Aussie Invader II and a much more experienced race team. Alas the weather gods were again not kind. 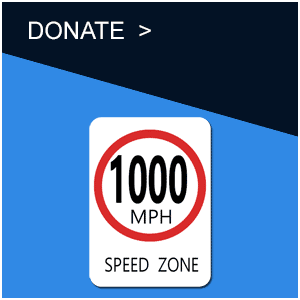 Rosco McGlashan became the “Fastest Aussie On Earth” with an official 500 mph two way pass. Not being content with just an Australian Record, Rosco convinced a nervous team to attempt the World Land Speed Record despite poor salt conditions, rain and bad light. A week later Rosco ran his racer southbound on a track in very poor condition. 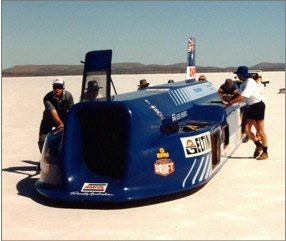 At 580 mph and accelerating, Aussie Invader II broke through the salt surface and tram-lined through the timing equipment 200 yards away from the track’s measured mile. Aussie Invader II was a write-off, immediately the team went to work on a sleeker, more aerodynamic car, known as Aussie Invader III. Fuel consumption was 10 litres per second! Wheels designed to spin at 8,000 RPM. 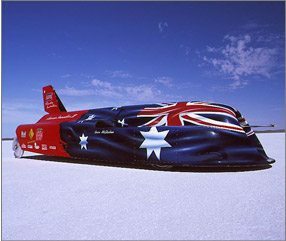 The Aussie Invader Team returned to Lake Gairdner in South Australia in 1996 and after some test passes, recorded a peak speed of 638 mph. This was faster than the then World Land Speed Record held by Richard Noble at 633 mph. However, to claim a new world record, two passes must be made in opposite directions within one hour. Again bad weather prevented the team from achieving this goal. Powered by a J34 Westinghouse Jet Engine with purpose built after-burner. Originally fitted to the Lockheed Neptune as a Jato engine. Aussie Invader IV had 6,500 lbs of thrust which is equivalent to 6,500 hp and was capable of 0-450 km/h (280 mph) in 5 seconds.